Future Harvest Grow Light Garden is the perfect kit for indoor salad or microgreen production! The compact size and shape of this unit is ideal for table or kitchen counter-top use. The sturdy recycled plastic base acts as a reservoir for water. In this tray sits a stand covered by a sheet of absorbent cloth that draws water up and into the bottoms of the planted seed trays by capillary action. The hood’s height is fully adjustable. Once seedlings sprout, lower the hood to about 10cm (4″) from the tops of the plants, and they will grow bushy, strong, and compact. 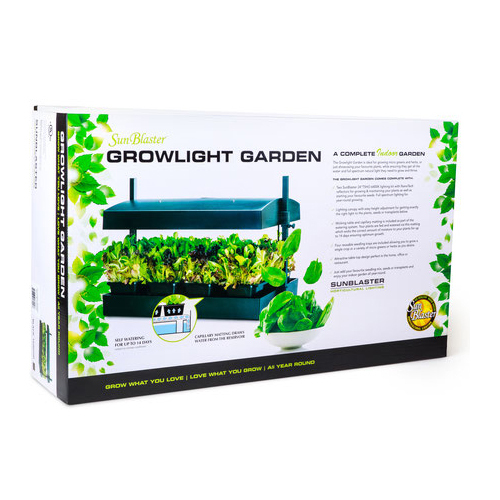 The Growlight Garden is also ideal for starting seedlings. It includes four reusable segmented trays for planting, the reservoir stand, wick sheet for optional “self watering,” and full instructions. This unit measures 60cm (24″) wide x 40cm (14″) deep x 43cm (17″) tall. All plastic components are 100% recycled.